Most people believe that when they buy stand up paddle bags, it’s going to protect their paddle board from damage. However, it’s important to understand that while there are bags that offer protection on the market, the majority are suitable for transporting your board from A to B and that’s all. What’s more, if you keep your board in your stand-up paddle bag for extended periods, you may find it can’t breathe, and damage begins to occur. 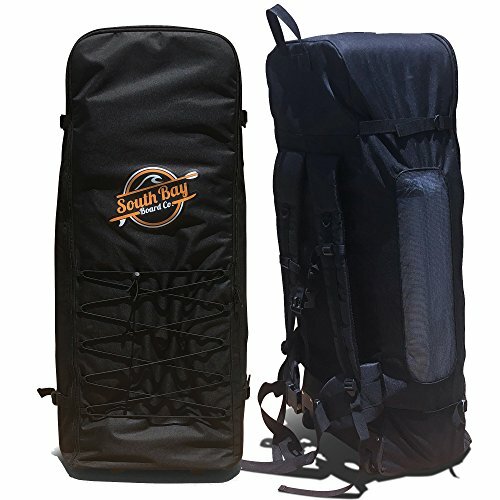 Therefore, there are many things you must consider when looking for a stand-up paddle bag for your board. Firstly, the ventilation counts for a lot, as does the protection. Do you need a bag that will transport your board, or will you need it for storage as well? Then, you need to consider the size of your board, how much foam is within the stand-up paddle bag, and the size and shape of your fin. To get the correct stand-up paddle bag, it’s more than a case of selecting a style you like. Check out these options below to find one that ticks all the boxes. If you own an inflatable paddle board, you will no doubt be in the market for a stand-up paddle bag that will make transport a breeze. Rather than load the board into your car and put up with the inconvenience, you can instead zip it inside the stand-up paddle bag with its pump and benefit from a complete form of transport. This bag, aside from the convenience it adds, has so many features that don’t reflect the affordable price tag. 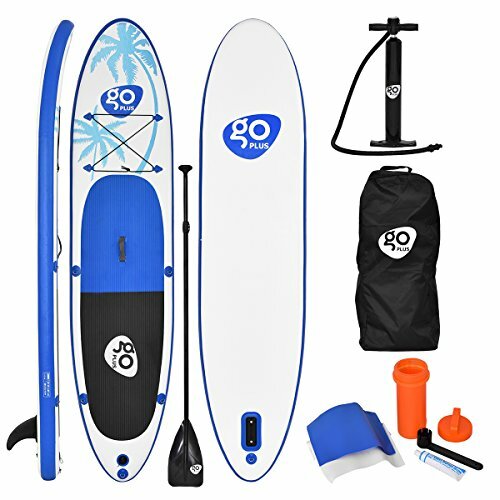 You can fit inflatable paddle boards of up to 12-foot-six-inches in length and 34 inches wide, the pump fits in seamlessly with it, and it’s a stylish and robust bag. What’s more, it even includes a roll strap that secures the board in place. Unlike many stand-up paddle bag types you will find on the market, this one also thinks of the importance of breathability. As a result, it includes mesh panels which help to dry out the remaining moisture off your board when you pack it away. It then features an internal pocket, adjustable padded shoulder straps for comfort and robust fabric to handle wear and tear. If you buy this stand-up paddle bag, you will be more than happy with your decision. Suitable for all inflatable paddle boards up to 12-foot-six-inches in length. If you want more than only a form of transport for your paddle board, then opt for the protection this stand-up paddle bag from ATX Deluxe instead. Rather than always having to worry about damaging your board when you take it to the beach, you can rest assured this bag has you covered. Not only does the robust canvas material provide ample protection against grazing and daily wear and tear, but the internal foam also plays a part. It protects your board from more substantial impact while making sure it stays as good as new within the stand-up paddle bag. However, the benefits don’t end there. You benefit from a fin slot to suit your paddle board perfectly, as well as tie-down slots. As a result, your board can stay snug and secure – even in transit. It also features a shoulder strap you can remove, as well as being suitable for a wide variety of paddle boards. Suitable for boards up to 32.5 inches wide and five inches thick. If you find yourself running into difficulties every time you want to go paddle boarding, then it might be time to invest in a new stand-up paddle bag. Transportation for such a large item can be troublesome, even if inflatable boards pack down to a small size. You still have to think about how to get it to the beach without damaging it or risking puncture. This stand-up paddle bag from Thurso Surf solves that problem immediately. Not only is it a convenient bag for a paddle board and all its accessories, but it protects them equally as much as it provides them with a permanent home. The outer shell of the stand-up paddle bag is nylon for better durability against wear and tear, while three straps help to make transportation that little bit easier. The torso strap enables you to distribute the weight more evenly, while the back and waist straps give you more control when you’re carrying it. You will also enjoy the carry handles for effortless transportation, as well as the robust zipper for keeping everything secure and in place. If you already own a stand-up paddle bag for long-term storage, but you’re looking for one for transportation, you will find this bag from SurfStow could be a valid option. Not only is it competitively priced, meaning it is sure to fall within your budget, but it’s a convenient design which makes it a firm favorite for transportation. You can use it with boards between 8-foot-six-inches and 10 feet in length, as well as those up to 36 inches wide. 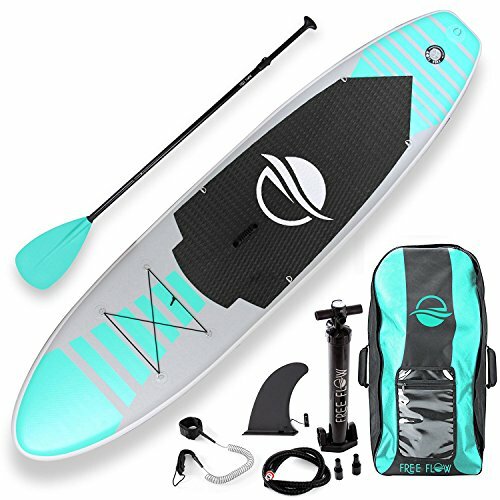 What’s more, it features a unique two-piece design, rather than a stand-up paddle bag with a zip function. Put the board in one end then put the other end cover over the top. You can then use the cinch straps to tie the two sides together for a seamless bag. Within the stand-up paddle bag, you also benefit from a quarter-inch of foam, giving you peace of mind that transportation won’t be a problem. What’s more, you can use the comfortable padded shoulder strap and handles to put it into your vehicle and take it out again. While you can’t use this bag for long-term storage, it’s a convenient and affordable bag for short-term transportation when you’re ready for some fun at the beach. Suitable for boards from 8-foot-six-inches through to 10 feet and 36 inches wide. When you’re traveling to find the best surf possible, you can end up loading your stand-up paddle bag and booking a ticket to the tourist hot spots. However, if you don’t have a suitable stand-up paddle bag that’s ideal for flying, it can be challenging to take your paddleboard with you. If you buy this one from NIXY, however, you can rest assured it’s more than up to the journey. 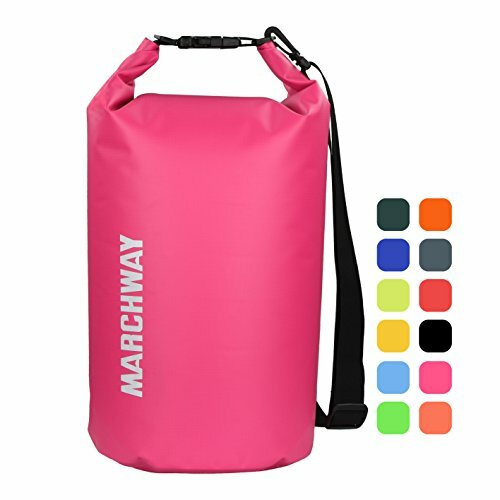 It features robust nylon fabric to handle wear and tear, all the while featuring one large main pocket and an additional front pocket for storage. These pockets, alongside the main bag and the straps, all feature double stitching for extra peace of mind. Therefore, you can rest assured that no amount of everyday wear and tear is a problem for this stand-up paddle bag. Because paddle boards can be traditionally cumbersome, you will also find the transportation features of this backpack handy. 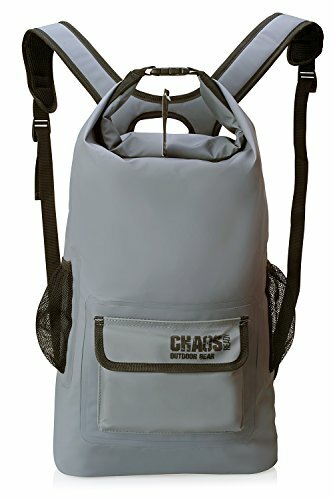 It comes with a top handle and three wheels, as well as a waist strap and padded backpack straps. As a result, you’re able to wheel it along the ground or carry it on your back – whichever is most comfortable for you. This bag is suitable for most inflatable paddle boards, and all NIXY paddle boards, making it a keen contender at the top of your wish list. When you’ve spent all your money on a new inflatable paddle board and have very little left over for a stand-up paddle bag, you will be pleasantly surprised by this bag’s price tag. Not only do you benefit from a robust and quality stand-up paddle bag to last the distance, but you don’t have to pay a lot of money for the privilege. 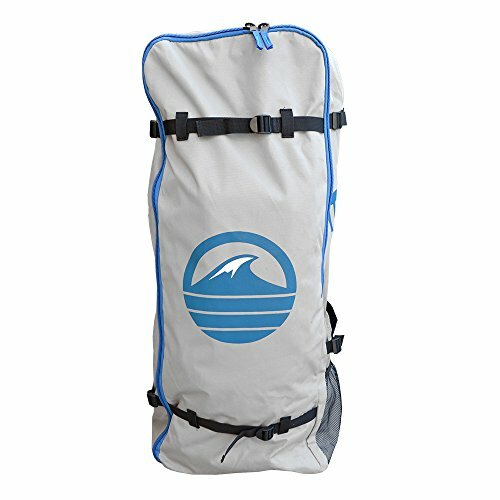 You can use this bag for housing your Ten Toes paddle board, or for use with other brands as well. It measures three feet by 1.5 feet, making it more than suitable for a range of inflatable boards. However, the benefits don’t end there. Not only does it provide safe transportation for your board, but it makes sure it’s safe and comfortable during the journey as well. There is mesh fabric for better breathability, alongside robust nylon to stand up to wear and tear. What’s more, you can use the shoulder straps and torso straps when you’re traveling with the bag and want to be comfortable. Carrying your inflatable paddle board to the beach without a stand-up paddle bag is a challenge. Not only do you have to try to bring a heavy deflated board, but the accompanying pump and accessories as well. This stand-up paddle bag is a game changer. It takes all the hassle out of a trip to the beach, all the while being suitable for long-term use and transportation. It fits your board, pump, and paddle, enables you to carry it on your back thanks to the straps, and it comes with storage for your fin as well. What’s more, if you need to take other items, there is a bungee cord area on the front to keep those firmly in place. While it features robust fabric, it’s also very breathable with plenty of mesh, keeping your board dry at all times. 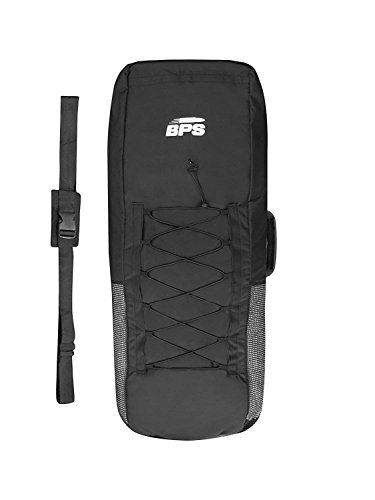 If you take paddle board sports seriously, then it’s time to upgrade to this stand-up paddle bag from FCS. For the racer or professional, it meets the mark in more ways than one. It has a premium airflow system to keep your board dry and free of moisture, as well as robust coffin wall construction to give you peace of mind that your board is safe. Within this area, you can also benefit from the compression cinches to keep the board in place, as well as additional reinforcing in the nose and tail. If you’re worried about the internal temperature affecting your board’s integrity, you don’t have to be concerned. This stand-up paddle bag features silver paneling which reflects the heat and controls the temperature. This bag is suitable for all manner of paddle boarders but will meet the mark for professionals who don’t want to compromise on quality. 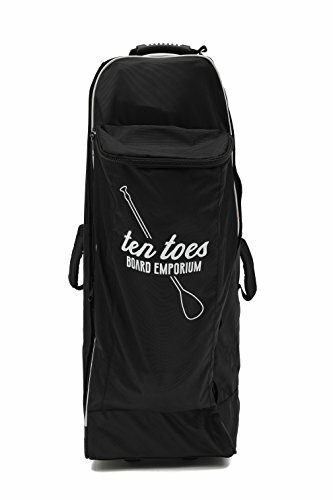 When paddle-boarding season begins, you will no doubt be looking for a stand-up paddle bag to take good care of your board as it travels from A to B. While this bag is not suitable for long-term storage, it does meet the mark as a day bag for those long journeys to the beach. It features robust closed cell padding which is waterproof to keep your board safe, all the while offering a range of user-friendly features for your benefit. These include metal clips, a robust zipper system including the fin slot, carry handles and shoulder straps, as well as a heat shield featuring mirror foil. If you’re worried about wear and tear, this bag will tick all the boxes. It features a PVC nose protector, as well as robust outer material to handle grazes and daily trips. This bag is well worth your inspection.